With the Sanrio Festival or correctly known as-- Hello Kitty Festival or Supercute Friendship Festival coming to Los Angeles in about two weeks, I was ready to start preparations for the event. It is a special event that focuses on more than one Sanrio character other than Hello Kitty. It is a smaller scale version of Hello Kitty Con but with more characters featured. If you didn't read up about the North America tour, then you can get more information here. "Hello Kitty is hitting the road with her first-ever live entertainment show and North American tour! Join the fun, friendship and festivities with multi-stage live performances, interactive entertainment, fashion, photo opportunities, and lots of special Sanrio surprises"
First thing I did a month and a half ago was book an appointment with my favorite nail salon at Marie Nails. The day before my scheduled appointment, I had realized that I had procrastinated for way too long on my many projects, but never got around to finish. One being maintaining this site and finding a nail art design for my appointment. Luckily, I had saved sample nail art designs that I found off the internet. 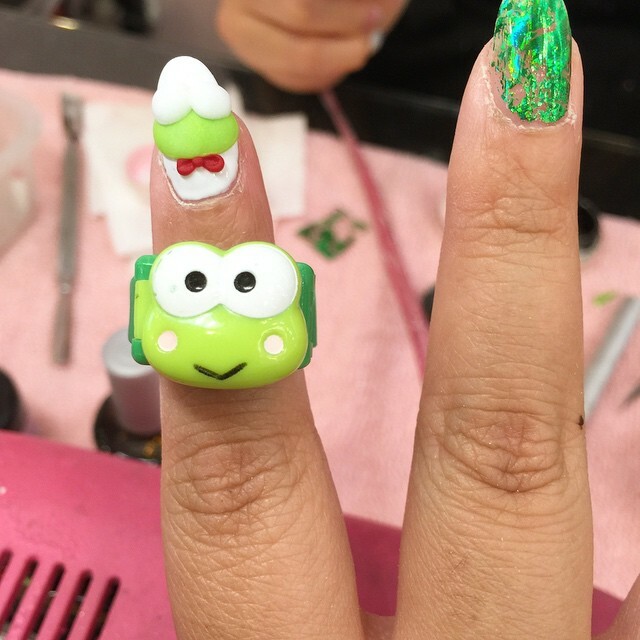 With a color coordination in mind, I brought it to my favorite nail technician, Mika, who helped guided me to my final Keroppi nail art design. I brought in my vintage ring watch for a visual example to help guide the nail technician. The result is that she made a lovelier version of Keroppi than I expected. In addition to the face, I requested the red bow, which turned out great. 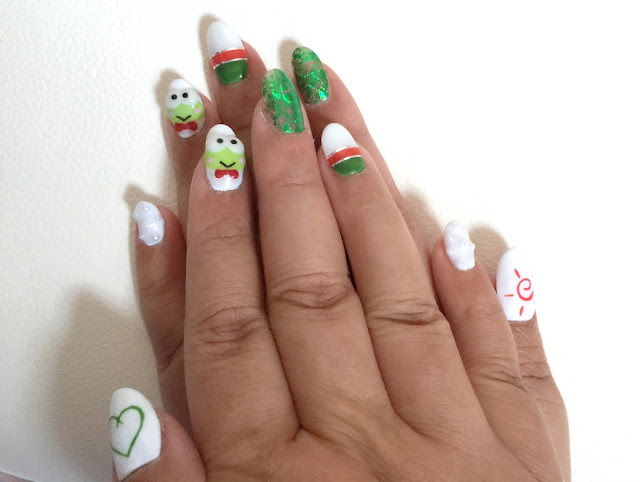 In this Keroppi nail art design, I wanted to incorporate Keroppi's life background while maintaining that cute factor. Again, I went the simple route. Probably my next attempt with Keroppi and Hello Kitty, I'll go more elaborate in design. I chose a pond leaf that looked like a heart outline, but was really meant to represent the leaf pond that you always see in Keroppi designs. 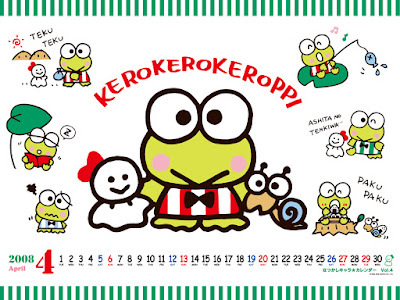 The last design is the red little sun art that is in my favorite Keroppi 90's series design of products. Lastly, the colors that I have chosen are the the colors that I feel best represents the lovable frog: green, white, and red. This is the character that I have chosen to sport in the upcoming Sanrio event. 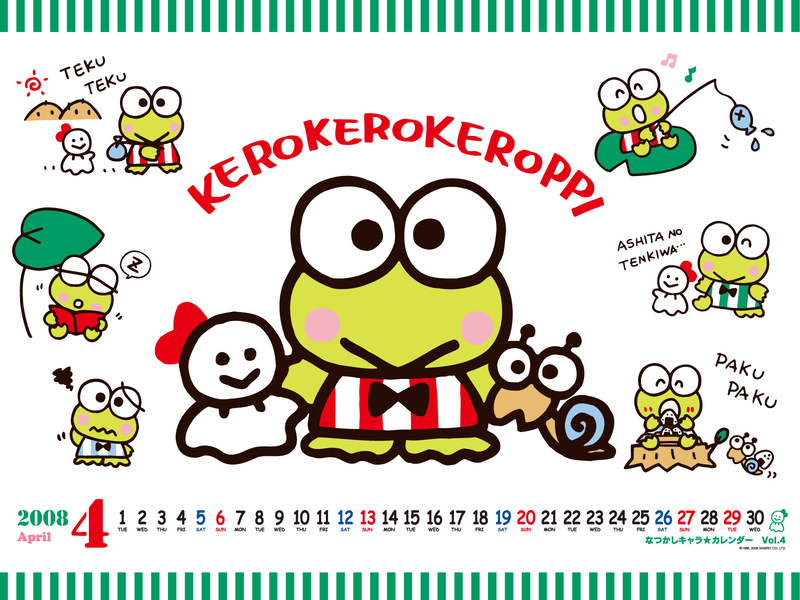 As my third favorite character, I'll be there scouring all the Keroppi merchandise to bring home. Maybe this time, my Keroppi collection can grow.